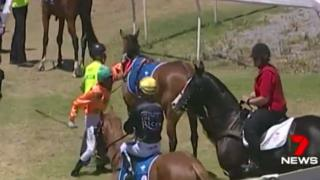 A jockey has been suspended for punching his horse before a race in South Australia. Video of the incident shows Dylan Caboche, 22, mounted on the horse, She’s Reneldasgirl, and struggling to guide it to the starting gates. He then dismounts and hits the horse in the ribs. Racing authorities handed the apprentice jockey a two-week suspension for misconduct over the incident in Port Lincoln on Wednesday. Thoroughbred Racing South Australia said it “does not condone and will not tolerate such behaviour”. “It is hoped this penalty – which will remain on the rider’s record and will impact his earning ability – will send a strong signal to others,” it said in a statement. However animal welfare groups have criticised the length of the penalty. “Two weeks suspension. We’re meant to believe this is an industry that takes animal welfare seriously,” Coalition for the Protection of Racehorses wrote on Facebook. Concerns about animal rights were also raised this week following Australia’s premier horse race, the Melbourne Cup. One horse had to be put down after falling in a separate race at the event. In September, jockey Davy Russell was given a four-day ban after punching a horse on the back of the head before a race at Tramore in Ireland.